WordPress co-founder Matt Mullenweg is talking about the state of the platform here at the final morning session of WordCamp San Francisco. History lesson: Mullenweg’s coding journey began with a patch for b2 content management system which led him and co-founder Mike Little to pull the best features of various blogging systems into the platform now known as WordPress. 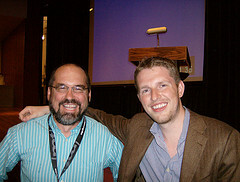 Mullenweg credits the open source model for much of his success building the WordPress empire. WordPress Growing: 11 million downloads, 58 million posts, 22 *billion* pageviews. 4.9 billion spams killed by Akismet, up only slightly from last year. This entry was posted in technology and tagged mullenweg, wor, WordCamp, wordcamp sf by Joe Hunkins. Bookmark the permalink.